Along with Mirren, the venerable Ed Harris (looking very craggy albeit not too creaky...) appears as the villain du jour. And Bruce Greenwood plays The President. Yes, that's how he's listed in the credits: The President. I'm thinking The Wibberley's (and yes, that's how the writing team of Cormac and Marianne Wibberley are credited. I think it's cute!) may have run out of names for their characters. They were reduced to calling minor players Agent Sledge and Agent Hammer, Agent Stayres and Agent Steppes. Or perhaps they were just indulging themselves in a bit of writer humor...you can get a bit punchy staring at a blank computer screen! The plot is highly improbable, but who cares? You've got car chases, car crashes (those Mercedes sure take a licking and keep on going, don't they? ), great settings and a dash of history. Even if it is stretched to its limits. Yeah, it makes no sense that Gates and Poole would have top of the line high tech computer equipment to hack into security systems but be reduced to photographing clues and artifacts with crummy camera phones. Or that Ed Harris' Mitch Wilkinson would need to coerce Gates into seeking treasure by framing his great great grandfather. Seems to me you'd just need to say, "Hey, I know of a treasure--want to help me find it?" 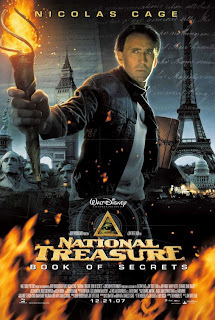 That IS what Benjamin Franklin Gates is after all--a treasure hunter. I can't say I liked this movie as much as you did. It had it's funny moments and the casting is great. But it just lost it's believability from the first installment. Well of course you're right--it was highly implausible. But with all the dark and grim movies out there right now, it was a nice change to just see some mindless fun entertainment.